Amidst the strife and civil unrest of the 1840’s, a group of settlers around a “Sandy Spring” felt a need to begin a prayer meeting. Although these families (Powers, Austin, Burdett, Spruill, Mitchell) were widely scattered in the area, they continued to meet regularly until September of 1848, when they invited the Reverend John W. Yarborough and Reverend John Hinton to come and preach a “revival” in the brush arbor which they had built as a place to meet and worship. It was at this meeting, the first “camp meeting” on the grounds, that the Sandy Springs community’s first church was founded. Sometime between 1849 and 1851, five acres were given by Wilson Spruill and a log cabin was constructed, enabling the members to worship year-round for the first time. This structure also served as the community school. The circuit rider who served them had a salary of $10 in cash, three bushels of corn, and twelve chickens. 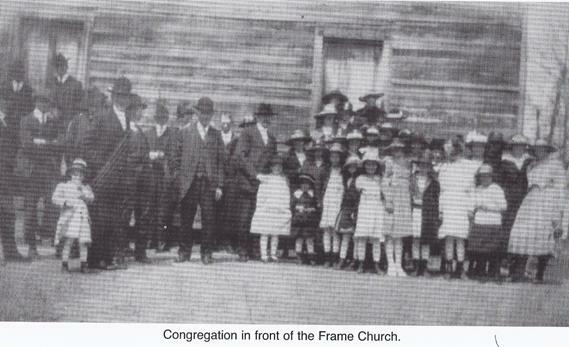 The congregation continued to worship in the log cabin until the Civil War ended and a white frame building was constructed on the site where the bell tower now stands. Camp meetings, which continued well into the twentieth century were an integral part of the growth of the Sandy Springs United Methodist Church. Hundreds of people attended and built “tents” for the ten-day revival. In 1920, the brick structure (shown right) was built to accommodate the congregation. The first youth group, The Epworth League was organized in 1923, and the Women’s Missionary Society (think UMW) got its start in 1924. The church continued to grow, with 250 members in 1940. SSUMC saw phenomenal growth, with a membership of 500 in the mid-1950’s, as the area around Sandy Springs prospered. Growth continued in the sixties, with the construction of our current worship space in 1961, to accommodate the increase. The ministry capabilities of the church were increased again by the construction of the Activities Center which was built in memory of Ricky Hitson in 1986. Today, Sandy Springs United Methodist Church is an active, mission-oriented congregation that strives to reach out not only to those in our community, but also to people in need around the world.